Loved all your comments on the knitter conversation. I’m still trying to decide which one of you is right. I’m betting that she has an acrylic garter stitch scarf full of holes in her knitting bag and she was afraid I would see it! As long as she doesn’t think I’m a weirdo who looks in people’s cars I’m OK with whatever knitting sphere she dwells in. My mom has been visiting us all week, which has been a lot of fun an a blessed relief from some of the more mundane parts of the week. It is so, so nice to cook supper without two children screaming at my feet the entire time. Instead they’ve been busy playing and I’ve had a chance to chill. In fact, my mom is upstairs and putting Little Man to bed right now. Thank you Mom!!!! Skeptic: It’s too baggy in the toe. Skeptic: I told you not to knit me socks. They aren’t gonna fit. Me: Yes they are. These will be the best socks ever and you will beg me to make more of them for you. Skeptic: They’re going to fall down. Me: No they won’t, they are RIBBED!!!! How can I possibly live with a person like this? And more so, WHY am I knitting him socks? Do you all see why he has this nickname now? But I do love him dearly. His glass half empty approach balances out my glass overflowing approach to life. Isn’t it funny how people match up like that? Well, my mom is down, the boys are asleep and it’s time for a movie. One last random thing. (This is a very blabby post). Did anone read the old school/new school articles on the lastest Vogue? What did you think? I’m curious. I bet he’ll change his tune on the socks once he gets them on his feet – I know my husband did. Have you knit him socks before? Poor Skeptic…to never know the joy of a leap of faith! Of course he will also never know the pain of falling face first, but that’s probably why we have the pragmatists around. Someone needs to scrape people like me off the sides of buildings! Love the bag and I’m sure the socks will be the best socks ever!!!!! “You just can’t help yourself, can you? Now tell me something good.” I don’t know why we love them, we just do. Goodness! I might have trouble with that skepticism all the time! Good thing you don’t. 😀 That bag is fabulous! I read those articles. I’m not really sure what my thoughts are, though. How about you? Love the bag! Great fabric selections! Just don’t knit him any more socks. Knit them for yourself and knittykids. You’ll be happier. I love that bag, the pattern is just perfect! Wow, such negativity from the Skeptic about your crafting, will be glad to see you prove him wrong on socks and bag 😉 The bag is really pretty! Congrats on your new blog too! Glad you posted the link on your other blog! I was lost. Great bag! Boys are stupid. Great bag! Lucky he didn’t catch you on a hormonal day, huh? I’d’ve been in tears if my dh caught me on a bad day! Just think about how pleased everyone will be when the socks fit perfectly! Love the bag. 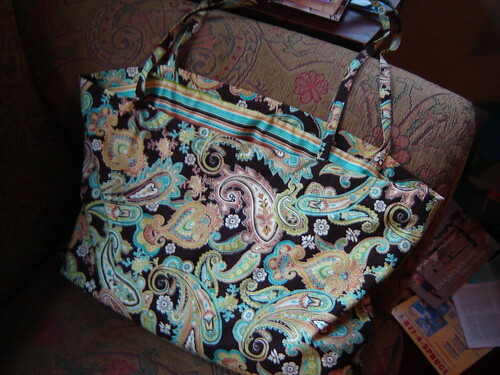 I recently made myself a Vera Bradley look-alike and I love it. It’s fun to create your own. Do you think you will be doing another Coffee swap this Fall? My goodness, some of the Skeptic bashing here – he really is a wonderful guy everyone! I predict he will wear those socks w/ pride! The bag is wonderful! I hope the newly found knitting mom warms up to you.